In the current release of databases we have five new databases and additional material added in four others. These databases cover a time span from 1916 to 1963 and include areas of the country from the north to the south. Please check out our promo for this database release. 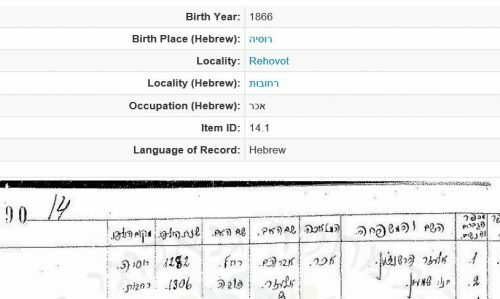 This database is in handwritten Hebrew. The information is presented according to families. There is a “head” and then a notation is made for the others in the family. The columns show the name, occupation, name of father, name of mother, year of birth and place of birth. You’ll notice in the above example that the birth year is listed as 1866 (on our summary), but when looking at the image we see the year 1282! As the source of this information is the Nufus (a form of census) and we note the year, 1916 (during the Ottoman Period) we realize that this uses a different calendar. 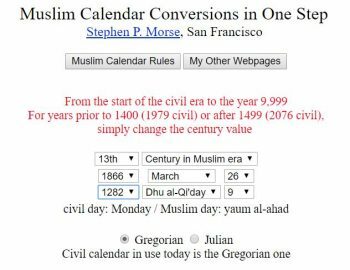 Steve Morse has a calendar converter that helps to quickly determine the date according to our current calendar. This database is also on handwritten pages. The calendar is the one we use today. The columns of information are: Language spoken, occupation, can they write, name, place of birth, age and nationality. Most of this information has been included in our summary. In this release we include the last names beginning with the letters Mem, Nun, Samech, Ayin and Peh. The Information you may find could have the name, name of the father, gender, age, community and the address they reported. The information is more limited in this database but includes the name, street or name of the house and the city. Mathilde Tagger z”l worked on many, many projects. One of them was to pull together the Heads of Households from the 1939 Population Census in Jerusalem. The data is typed and includes name, father’s name, age, country lived in before coming to Israel, status (married, single, widow…), occupation, neighborhood and the pages to identify where the full family information can be located. Additional marriage/divorce certificates have been added to this impressive database. As we have previously mentioned these certificates may be typed or handwritten. They have information about the bride and groom including names of the parents, their occupation and where they live; names of each of the partners, their residence, the community they belong to, their age and their occupation. These lists represent people coming in to Israel with a Visa organized by the Aliyah Department of the Jewish Agency. The information included on the typed pages includes: the name and age, the country they came from, the kind of Visa issued, if they were going to family – their names and where they lived or if they were considered Youth Aliyah, going to a kibbutz or other arrangment. There are some additional comments. The names of the individuals participating in this extraordinary Aliyah are available and there is information about where they came from, the camp they were in, and some identifying information. There is a link at the bottom of the page which will take you to the pages with much additional data. Another updated file, bringing now the letters C, D and M. The phone book is in English and the available information includes the name, address and phone number and possibly more. Can you volunteer?? With the heat of the summer, perhaps you are looking for something to do quietly at home for part of the day to get away from the heat. IGRA has projects in both English and Hebrew – and now some in French as well. Please join us in our efforts to make more of these records available to those involved in their family research. Contact us at: webmaster@genealogy.org.il and let us know you’re willing to volunteer.